To perform the plank on the ball on your knees start by kneeling in front of the ball, about a foot away from the ball and place your hands about shoulder width apart onto the front/top of the ball as shown. Lift your chest up, translate your head back so your ears are roughly over your shoulders. Keep your chin tucked down. Engage your abdominal muscles through abdominal hollowing and hold this position. Scapula is stabilized with serratus anterior. If your shoulders shake, or your shoulder blades start to poke out, stop. You have reached technical failure. If you experience any shoulder pain, stop. There should be no pain performing this exercise. 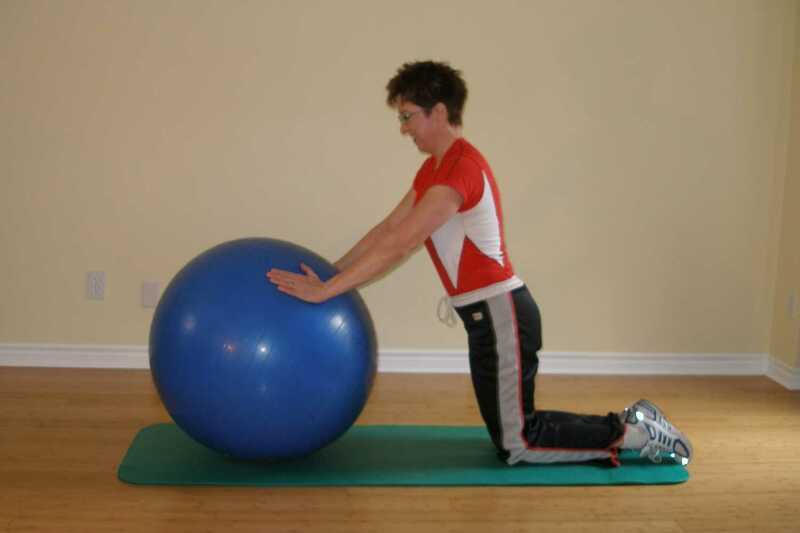 Try Ball Plank on Toes, and Knee Pushup on Ball. this is a great progression. All involve static control of the humerus in the glenoid with varying degrees of weight bearing and at varying angles of elevation. Hold this position 5 seconds and repeat 5 times. Hold this position 10 seconds and repeat 3 times. Hold this position 30 seconds and repeat 3 times.